As you should know by now, every week, we'll post a picture or illustration here reminding you of the consequences of passing Initiative 912. Here's this Thursday's Disaster Picture of the Week. 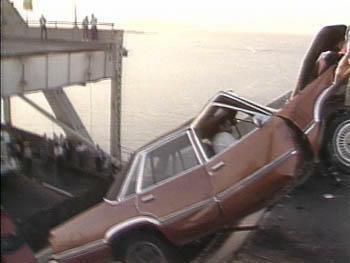 What you're looking at is a picture of the Oakland Bay Bridge collapse in the 1989 earthquake. A section of the bridge caved in, causing major damage and resulting in the structure's closure. Would YOU like to be the one in that car? Do YOU want to be on the viaduct, the floating bridge, or another critical structure when an earthquake strikes? People will be killed if these structures collapse. Our economy will be crippled. We can't continue to put lives at risk. Remember the 2001 Nisqually quake? We got lucky four years ago. Really lucky. That earthquake was a huge wake up call telling us we need to get ready for a disaster or we'll suffer a fate similiar to what New Orleans has suffered. Put Public Safety First. Vote NO on Initiative 912.